Dr. Richard Ordonez, a nanomaterials scientist at the Space and Naval Warfare Systems Center Pacific (SSC Pacific), was having stomach pains last year. So begins the story of the accidental discovery that honey—yes, the bee byproduct—is an effective, non-toxic substitute for the manipulation of the current and voltage characteristics of graphene. Ordonez' lab mate and friend Cody Hayashi gave him some store-bought honey as a Christmas gift and anti-inflammatory for his stomach, and Ordonez kept it near his work station for daily use. One day in the lab, the duo was investigating various dielectric materials they could use to fabricate a graphene transistor. First, the team tried to utilize water as a top-gate dielectric to manipulate graphene's electrical conductivity. This approach was unsuccessful, so they proceeded with various compositions of sugar and deionized water, another electrolyte, which still resulted in negligible performance. That's when the honey caught Ordonez' eye, and an accidental scientific breakthrough was realized. The finding is detailed in a paper in Nature Scientific Reports, in which the team describes how honey produces a nanometer-sized electric double layer at the interface with graphene that can be used to gate the ambipolar transport of graphene. "As a top-gate dielectric, water is much too conductive, so we moved to sugar and de-ionized water to control the ionic composition in hopes we could reduce conductivity," Ordonez explained. "However, sugar water didn't work for us either because, as a gate-dielectric, there was still too much leakage current. Out of frustration, literally inches away from me was the honey Cody had bought, so we decided to drop-cast the honey on graphene to act as top-gate dielectric— I thought maybe the honey would mimic dielectric gels I read about in literature. To our surprise—everyone said it's not going to work—we tried and it did." Ordonez, Hayashi, and a team of researchers from SSC Pacific, in collaboration with the University of Hawai′i at Mānoa, have been developing novel graphene devices as part of a Navy Innovative Science and Engineering (NISE)-funded effort to imbue the Navy with inexpensive, lightweight, flexible graphene-based devices that can be used as next-generation sensors and wearable devices. "Traditionally, electrolytic gate transistors are made with ionic gel materials," Hayashi said. "But you must be proficient with the processes to synthesize them, and it can take several months to figure out the correct recipe that is required for these gels to function in the environment. Some of the liquids are toxic, so experimentation must be conducted in an atmospheric-controlled environment. Honey is completely different—it performs similarly to these much more sophisticated materials, but is safe, inexpensive, and easier to use. The honey was an intermediate step towards using ionic gels, and possibly a replacement for certain applications." 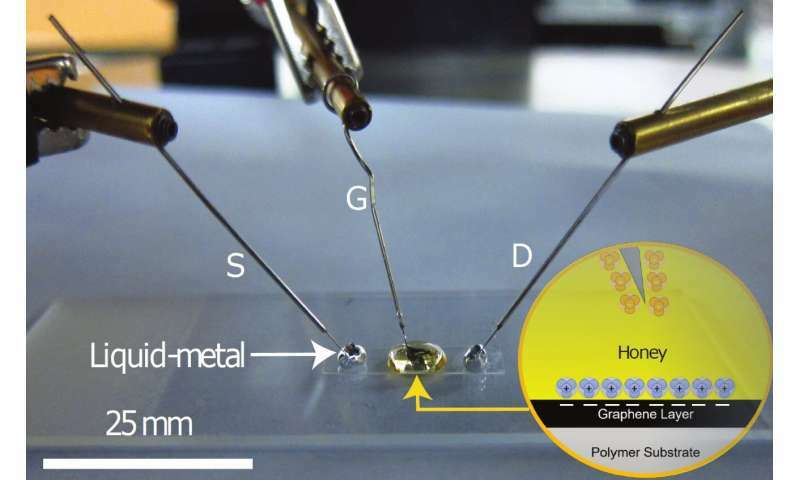 Ordonez and Hayashi envision the honey-based version of graphene products being used for rapid prototyping of devices, since the devices can be created quickly and easily redesigned based on results. Instead of having to spend months developing the materials before even beginning to incorporate it into devices, using honey allows the team to get initial tests underway without waiting for costly fabrication equipment. Ordonez also sees a use for such products in science, technology, engineering and math (STEM) outreach efforts, since the honey is non-toxic and could be used to teach students about graphene. This latest innovation and publication was a follow-on from the group's discovery last year that liquid metals can be used in place of rigid electrodes such as gold and silver to electrically contact graphene. This, coupled with research on graphene and multi-spectral detection, earned them the Federal Laboratory Consortium Far West Regional Award in the category of Outstanding Technology Development. SSC Pacific is the naval research and development lab responsible for ensuring Information Warfare superiority for warfighters, including the areas of cyber, command and control, intelligence, surveillance and reconnaissance, and space systems.